I have been behind with some of my adventures. Last Friday, February 18th, I gathered myself up and headed for State Game Lands 247 between Skinall and Center Hill, Pennsylvania. 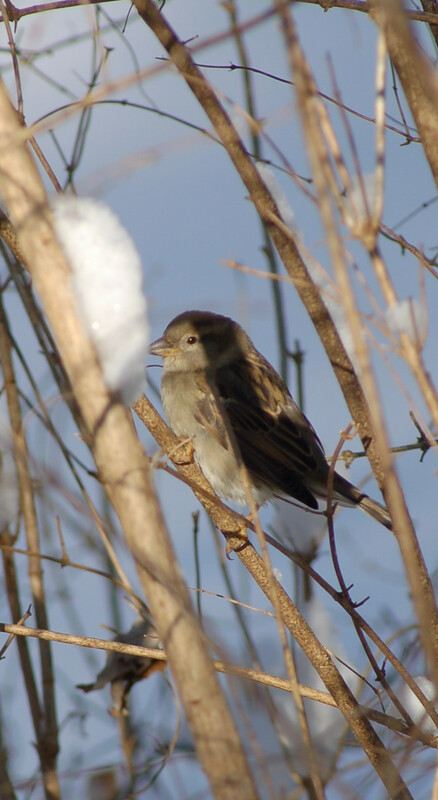 The day was very springlike with warming temperatures and plenty of birds-a-singin’. I noticed a quick scurry among some downed-limbs when I saw the form of a chipmunk. 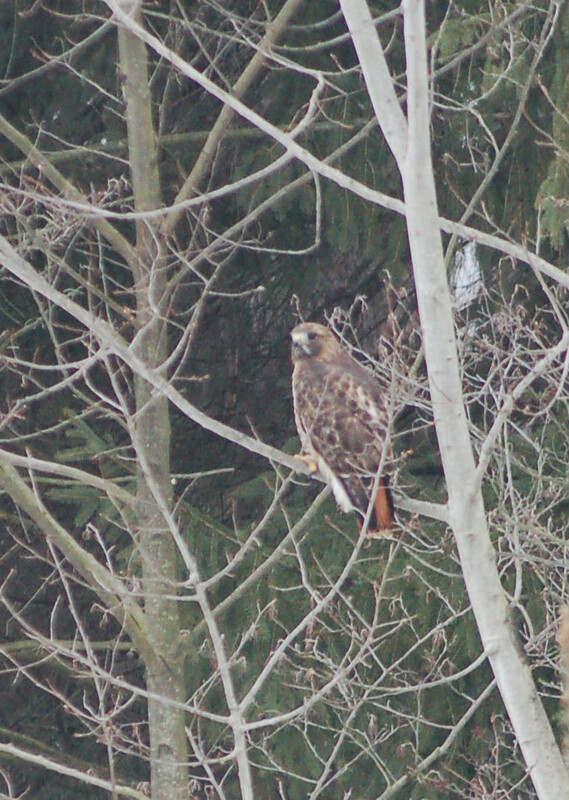 This was the first sighting in a while. I later saw a couple at the house rushing to duck under my deck. Laurie and I enjoy watching them over the summer. On northern and protected areas, some snow was still present. 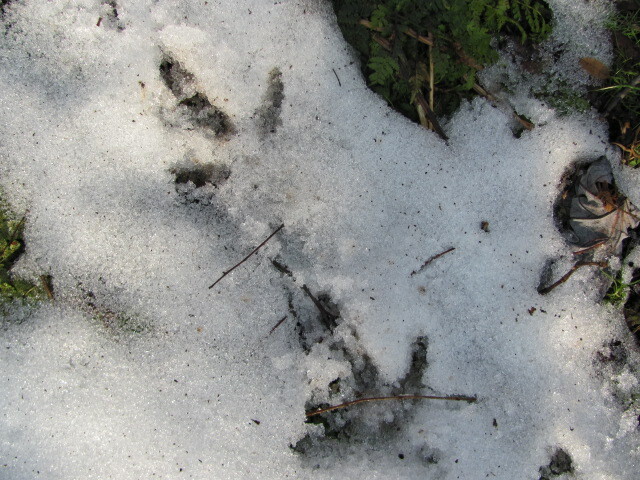 Here at one of these sites I noticed fairly fresh turkey tracks. I couldn’t say for sure if the birds left upon my approach or had been feeding earlier in the morning. I saw two deer too. I saw a couple of firsts for the year this day. I saw three turkey vultures and some grackles. usually their announcements to the year in this area are around mid-March. I found a dead 6-point buck and a mole. Questions began filling my mind as to the probable scenarios to their demise. February 21st, President’s Day, witnessed another heavy snow in our area. 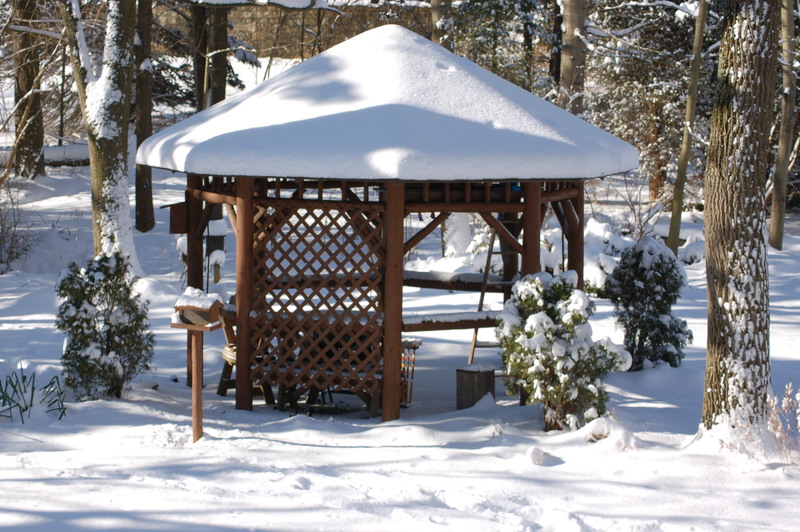 The following morning a total of 10-11 inches of snow could be viewed on my deck and yard and driveway and roof!!! 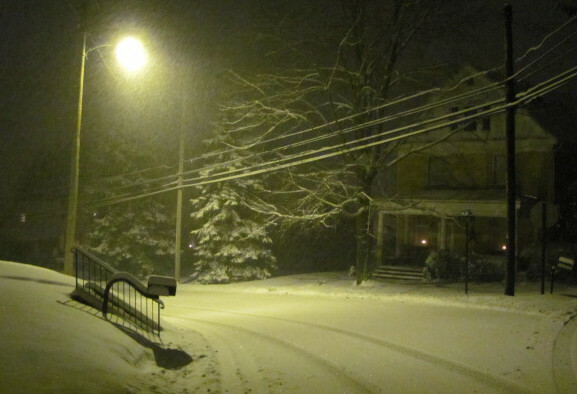 Laurie suggested a walk during the night hours during the snow. I quickly agreed and off we went walking about in the West Kittanning area. The falling snow made for some beautiful sights. Unfortunately, the winds were blowing steadily causing some chilled cheeks. The following morning forced several hours plowing and shoveling the heavy accumulation. Regardless, this day brought out the warming sunshine and the cleared areas quickly began to melt. Spring is near! The following morning, however, would bring a beautiful winter wonderland. Last year I completed a painting series known as the “Big Game Series.” I immediately began planning and painting the “furbearer series.” This group of paintings consist of four species of wildlife usually considered part of the furbearers. The four I selected to paint are the, ever popular, raccoon; the bobcat; the muskrat and the grey fox. 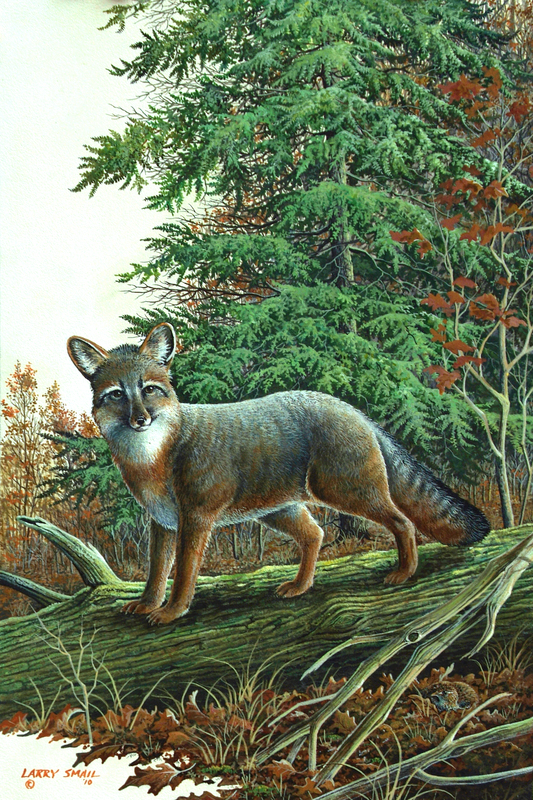 “Scent In The Air-Grey Fox” depicts a grey fox crossing a log when suddenly the aroma of ruffed grouse permeates the nostrils. The fox stops to check. A grouse is squatting beside the log hoping to remain undetected. 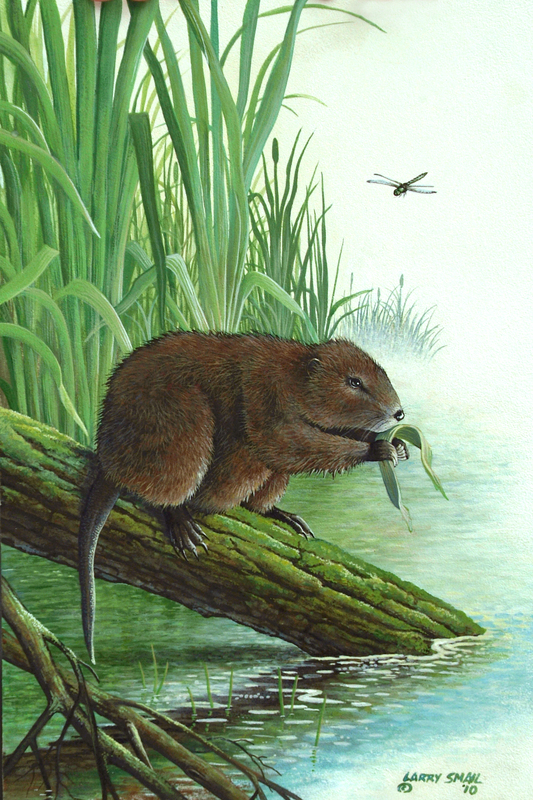 “Cattail Waters- Muskrat” shows a muskrat hungrily eating vegetation on a summer day. A dragonfly hovers nearby to watch. The bobcat is out surveying from its vantage point as the snow falls heavily. 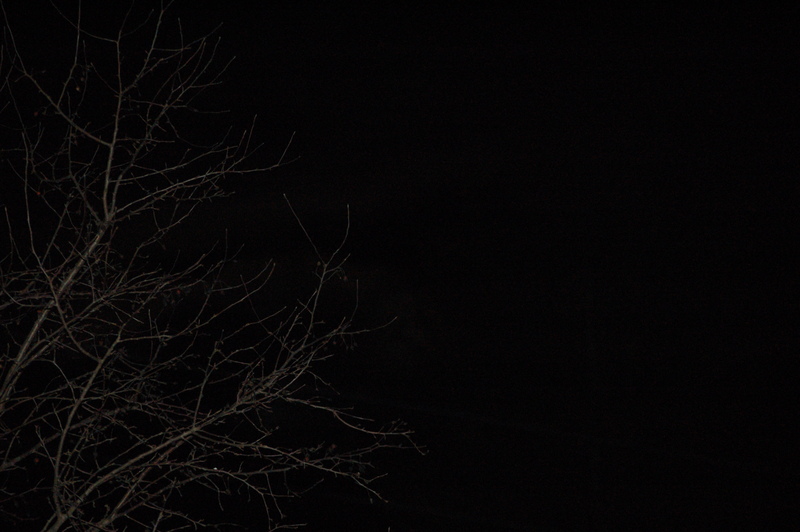 Two crows fly past heading for a roosting area. 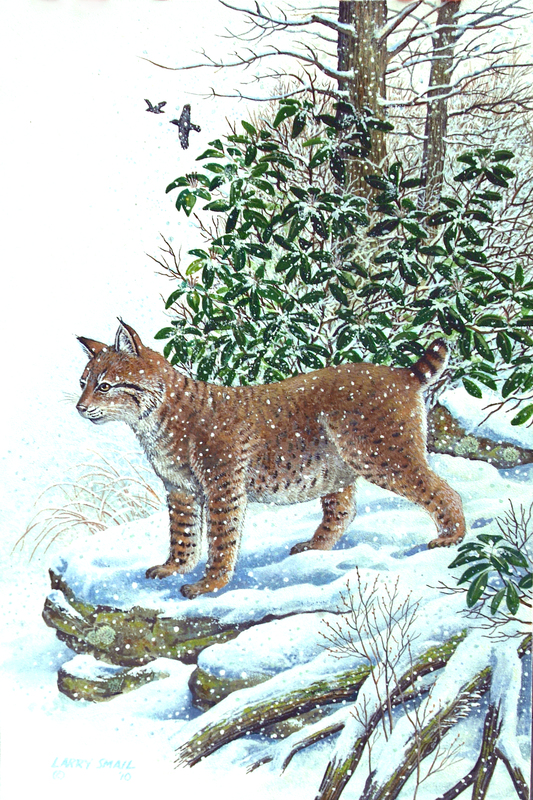 This painting is called, ” Snowy Ledge- Bobcat”. A fascinating critter known as the raccoon deserves respect. Many years ago, I had to go through the rabies shots because I failed to respect the speed of these animals and was bitten on the hand. 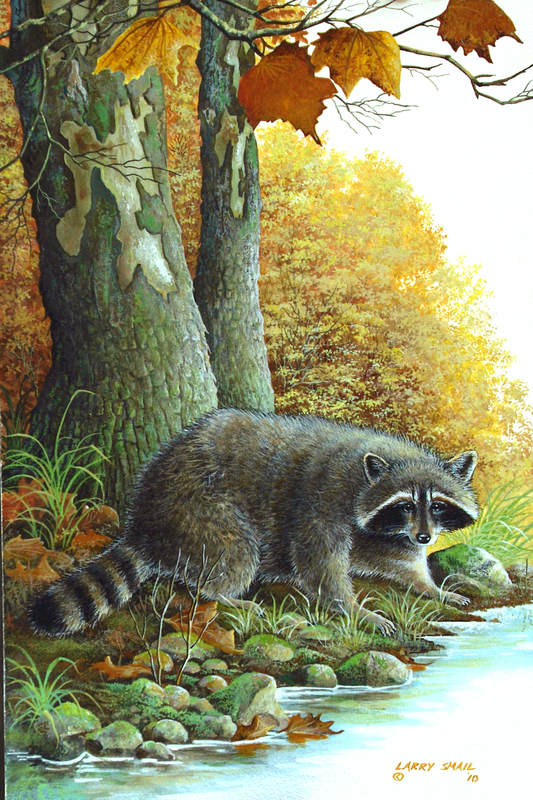 However, they are a beautiful mammal and “Streamside-Raccoon” is a painting depicting one of these critters along a stream in search of crayfish. Sometime soon, I wish to do a series featuring upland gamebirds. 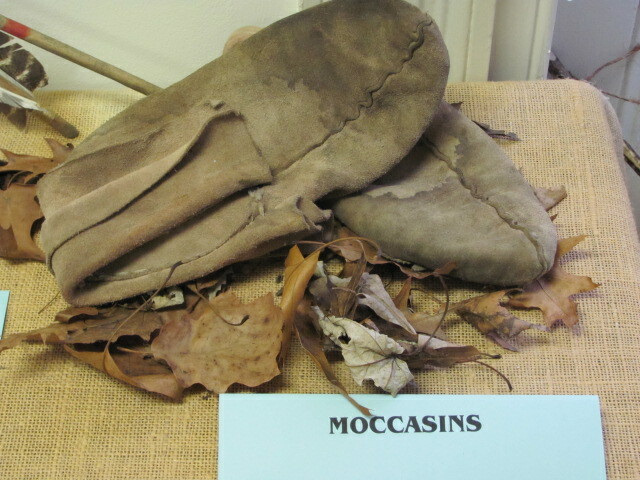 The ring-necked pheasent; the ruffed grouse; the woodcock and the mouring dove will, probably, be the species including with this series. COPYRIGHT LAWS APPLY TO ART! 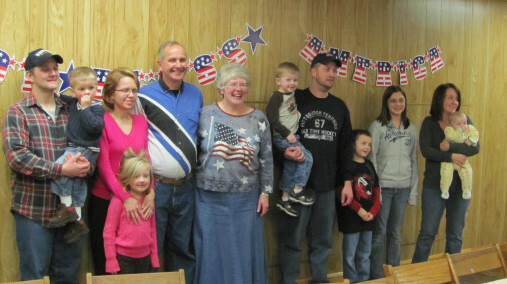 Friday evening, February 11, 2011 the Alamos Squares at the Frogtown Wildlife Club hosted a surprise coming home party for one of their own. 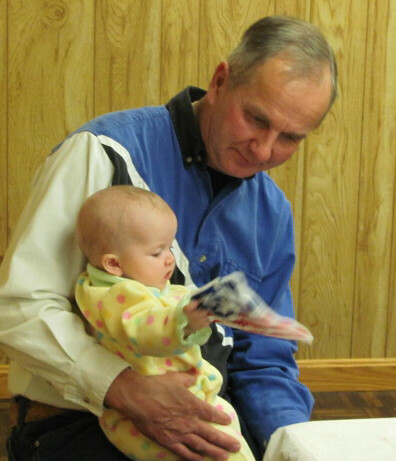 Bob Bemben had left for duty and missed the birth of his latest granddaughter. He sat for quite some time holding his precious little bundle…obviously quite happy to be home with her! 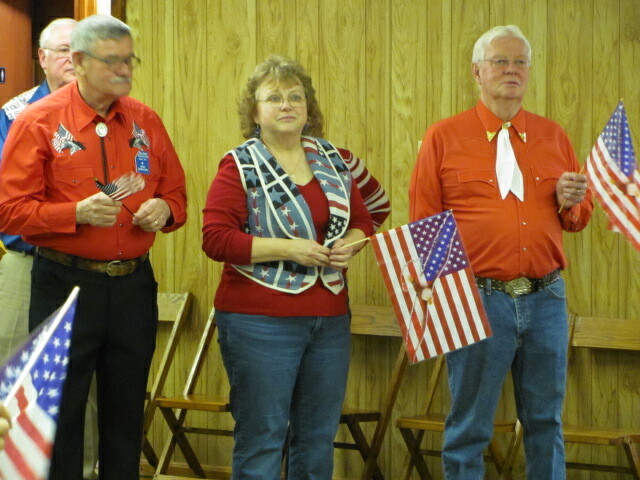 Bob upon taking the mic expressed his gratitude to all and especially to AMERICA. He spoke openly about the subject. Bob stated to not believe what you hear on much of the media shows. 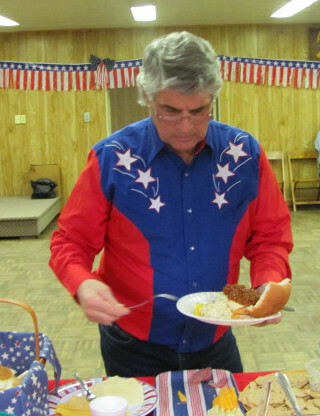 AMERICA, by far, is the best country in the world and we should never take this country for granted!!! Words well said! 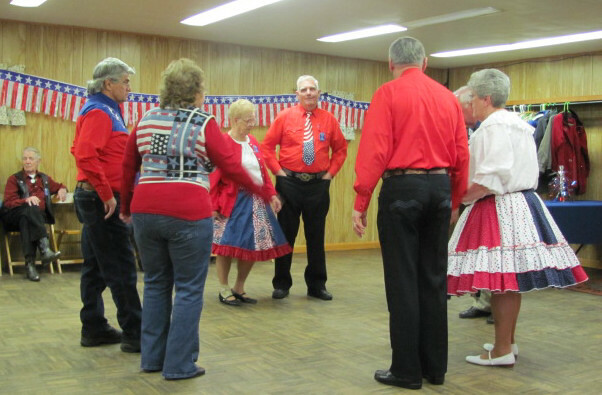 Throughout the evening , up to five squares, went through the motions of “western square dancing”. 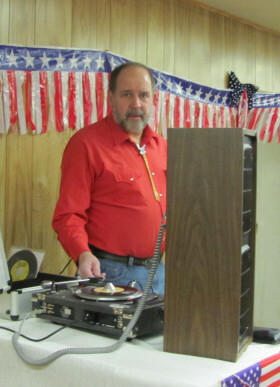 Local caller extraordinaire, Denny Steiner performed the calling during the festivities. Sometime I am going to take him aside and “learn” him to call “more gooder”! Eats and desserts were in abundance too. Homemade dishes and cakes! Ummmm-Ummm- good! 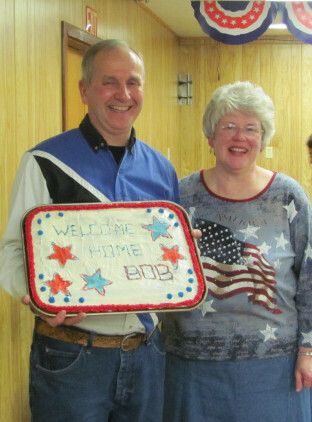 We are all so happy to have Bob back on America’s soil and I know he feels the same. WE are proud of his accomplishments and yearn for a time when “war will be no more.” Thank you Bob! 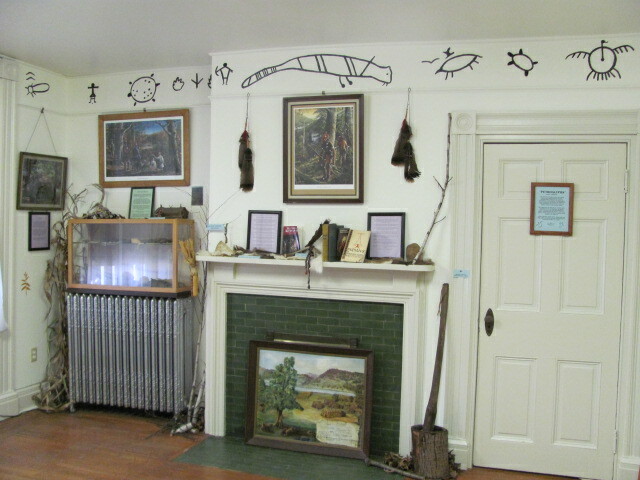 The old “Indian Room” in the Armstrong County Historical Museum is finally nearing completion. Properly speaking, I should verify that first sentence to read: nearing a point in time where viewers may walk about and educate and inform themselves concerning the native from this area of and surrounding Armstrong County, Pennsylvania. 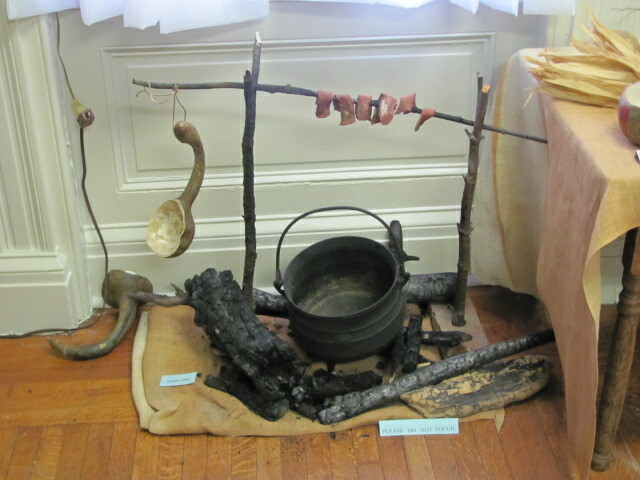 As stated within a previous blog entry, I expect items in this museum to change as more items become available. The building of the museum is known as the “McCain House” and is located at 300 North McKean Street, Kittanning, Pa., 16201. 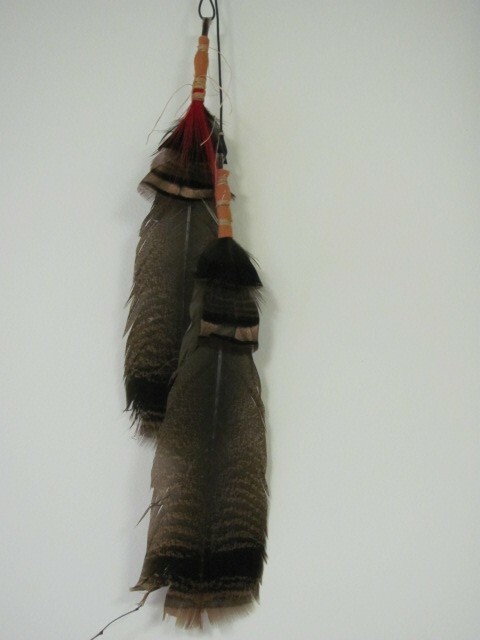 The “Native American Room” will be open to the public sometime in April. The exact grand opening of the recently renovated upstairs hasn’t been determined as of date. The military room and other rooms will, once again, be open to educate interested individuals of out local history. 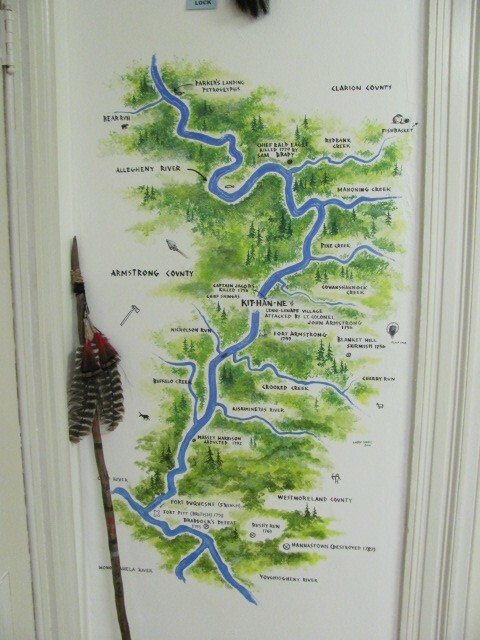 I painted a map on one section of wall depicting some of the early history of area, primarily just prior to the French & Indian War through the War of Independence. I painted a few “Indian Style” illustrations on available wall space. It is hoped these little extras will add to the feel of the times. I have , also, placed birch tree parts; leaves; pine limbs, etc. to further add to that special woodland experience. 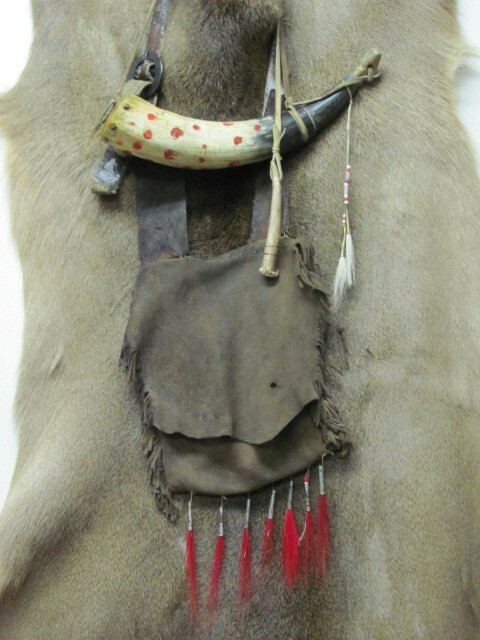 Afterall, the Indians of Pennsylvania are often known as the “woodland Indians”.